Hermes Un Jardin Sur Le Nil is sunny and seductive fragrance for women. 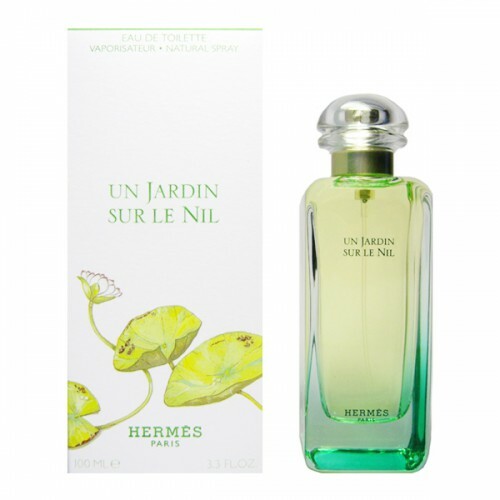 Hermes Un Jardin Sur Le Nil 100ml. Eau De Toilette is a luxury fresh fragrance perfect for summer season. Fragrance perfectly evokes the atmosphere of holiday and rest. Un Jardin Sur Le Nil is a scent that can cool even in the biggest heat of the sun due to the strong accents of grapefruit. Gradually, however, this wild freshness tamed slightly spicy aroma Calama (sweet flag). This creates a serene, soothing, yet fresh and exotic perfume. Un Jardin Sur Le Nil is appropriate for every woman who likes really enjoys his free time, moments of rest and relaxation. Luxury fragrance Un Jardin Sur Le Nil Hermes is inspired by the River Nile, so it is perfect for holiday time. This scent, however, can make extraordinary your every spare moment. Treat yourself to enjoy an incredible atmosphere and impression of unearthly beauty coast majestic Nile River, along with the scent of Hermes Un Jardin Sur Le Nil. Leading trading house Hermes perfumer Jean-Claude Ellen inspired by the ambiguity and contrasts Africa has created a stunning perfume, which is the epitome of optimism, joy and fun. Beauty exotic flowers of the Mediterranean are fully disclosed on the banks of the mighty river, the river and the pleasant freshness of the breeze envelops kindness and peace. Great spring and summer fragrance will appeal to both men and women, as is the category of unisex. The top notes Hermes Un Jardin Sur Le Nil distribute fluids happiness citrus grapefruit and green mangoes, and next door to them having fun grown on the banks of the Nile tomato and carrot. The "heart" of softly whispering reeds and peony, and dance a merry dance around the hyacinth, lotus and orange. Complete composition sparkling play of iris, musk, cinnamon, frankincense and labdanum.